It’s -13 F right now, and with a moderate wind blowing, the wind chill makes it -36 F. That’s too cold for me, but not too cold for the hungry birds and squirrels in the backyard to come into the bird feeders for a meal. 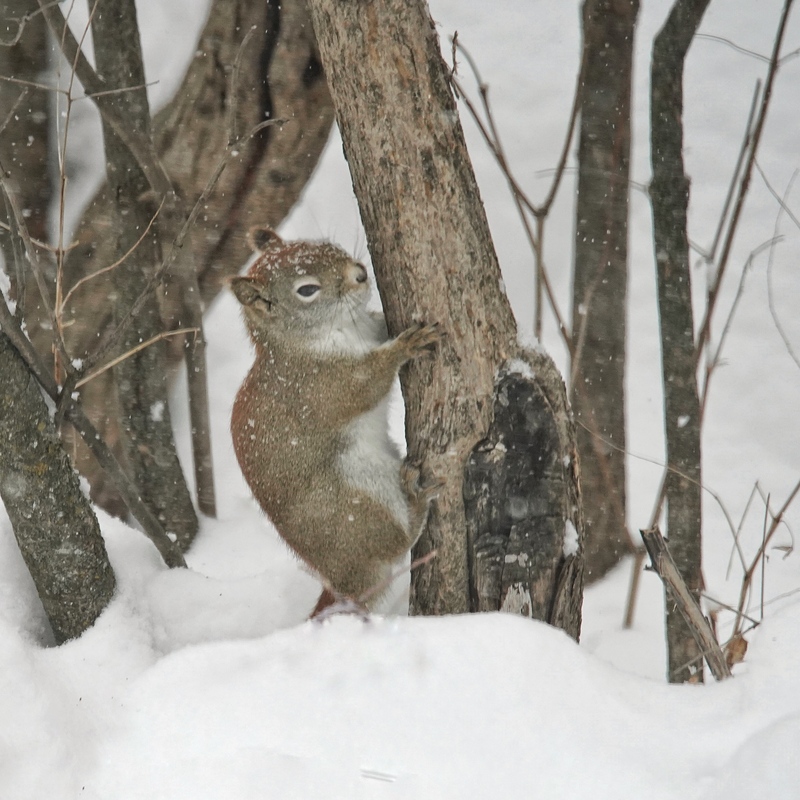 Gray squirrels don’t venture out until the sun is well up on these really cold days. 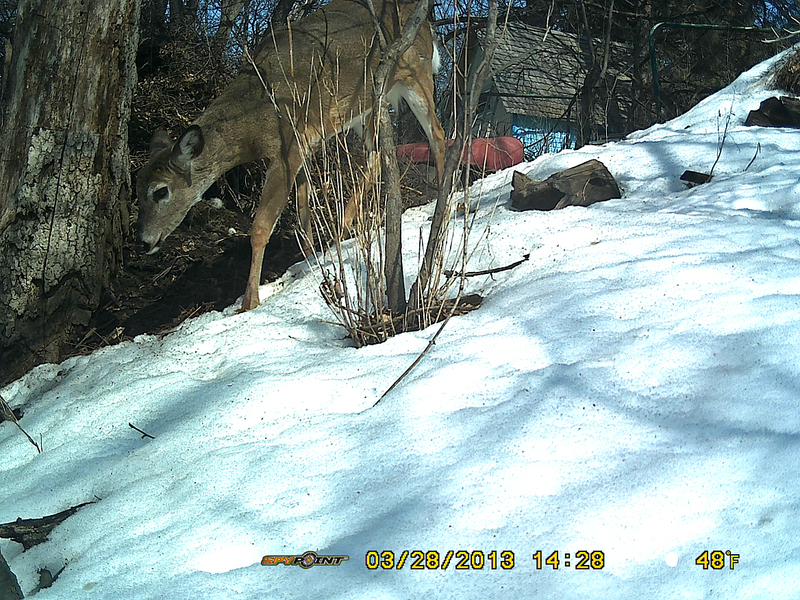 And before they cross snow patches to get to the feeders, they bask on the trees for a while to warm up, orienting the darker fur on their backs directly toward the sun. 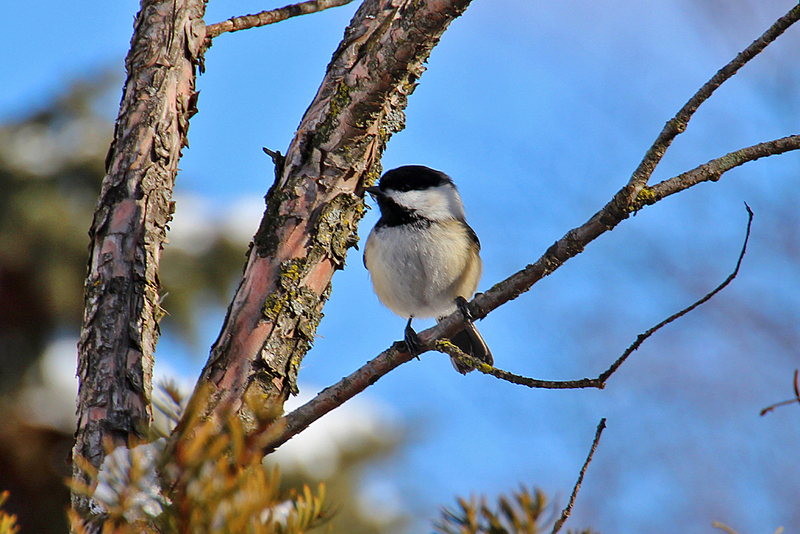 Even the chickadees take a few minutes between trips to the feeder to bask a little, fluffing their feathers out to make their tiny bodies into an almost spherical shape. 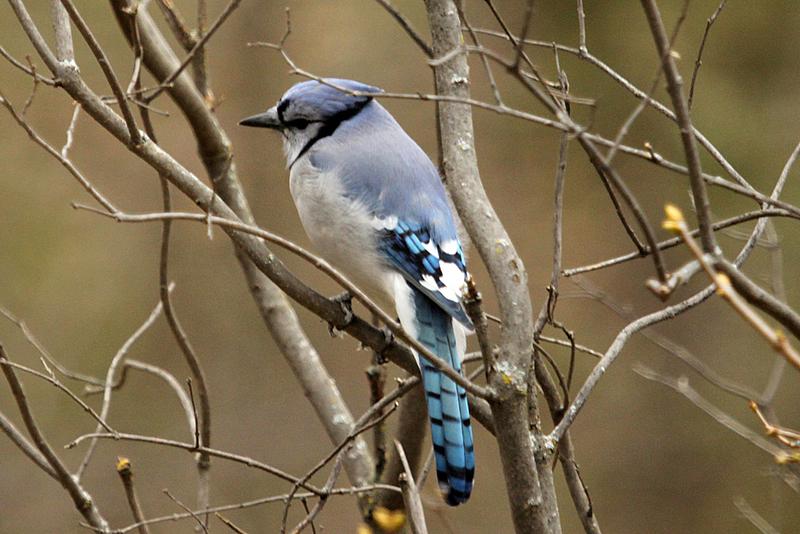 The bluejay must have been too cold to move — it just sat there looking around, squinting into the sun. 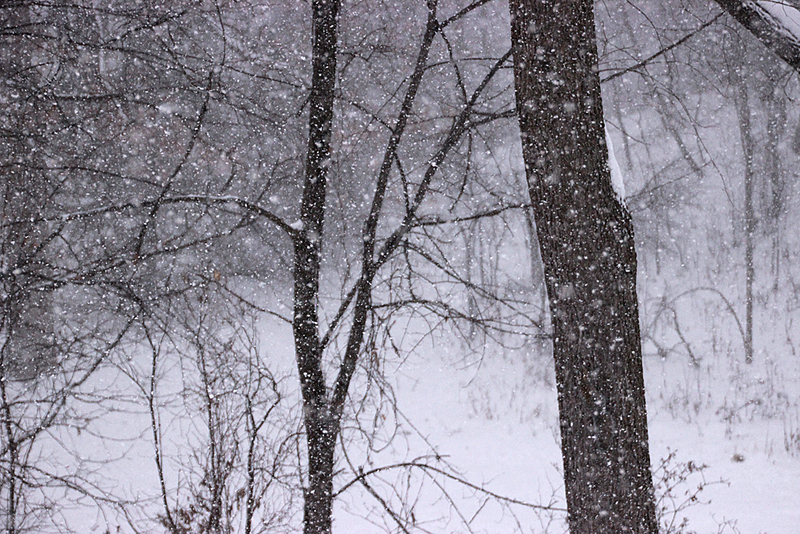 I could see the wind ruffling up its feathers — brrrrrrr. Basking to gain what little radiant heat the sun provides at this time of year can be effective in warming up, but wind currents that penetrate fur and feathers carry that precious heat away. 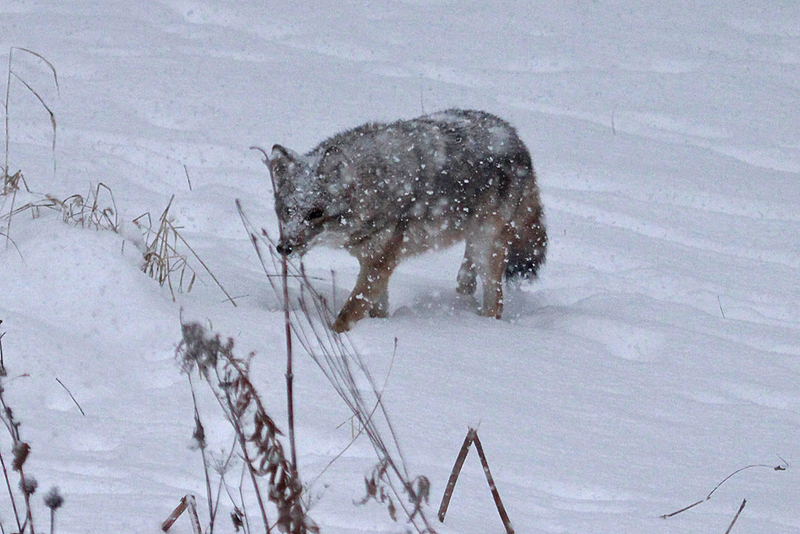 What can a small animal do to cope with this intense winter cold? Activity helps, as muscles generate heat, but that comes at a cost to be repaid by eating more. 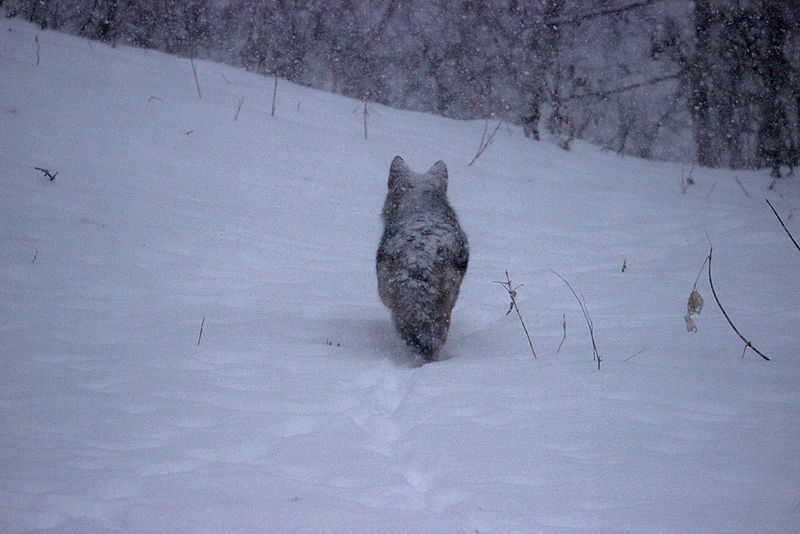 Shivering helps, and when animals are not active, muscles engage in isometric tremors that generate heat, which is also expensive, but not as much as flying or running across the snow and climbing trees. 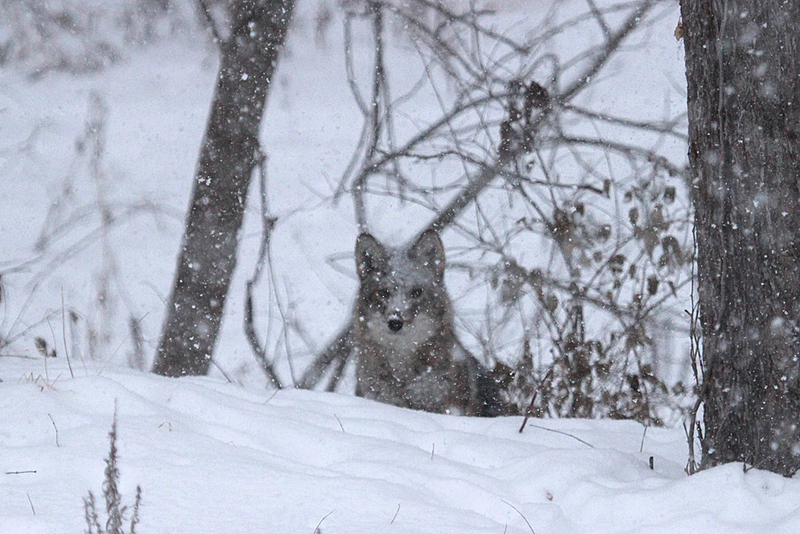 The only animals that seem unperturbed by this weather are the feisty little red squirrels. 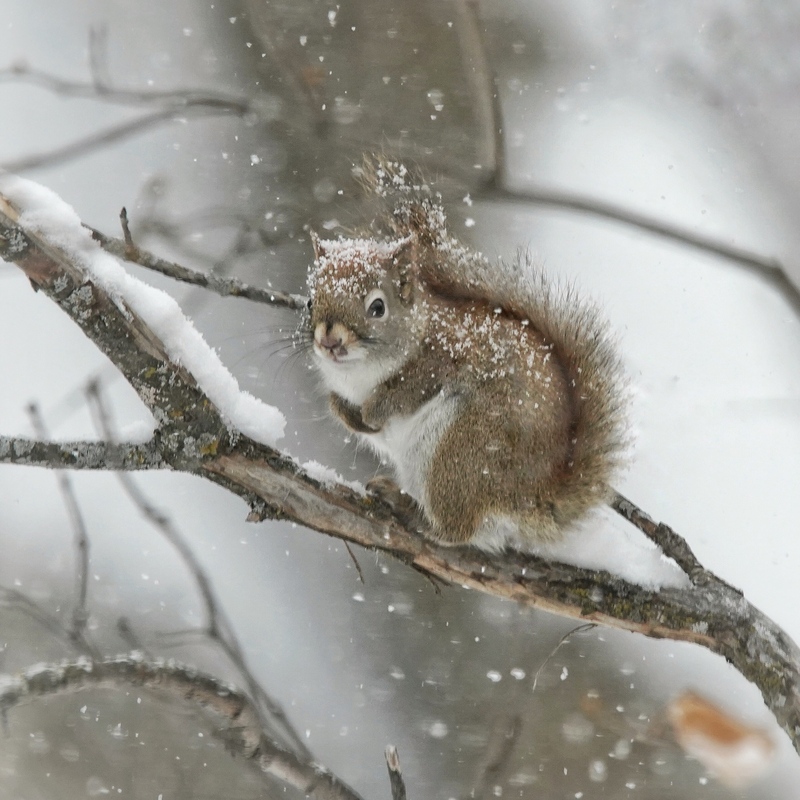 Red Squirrels must generate a lot of heat dashing around, because they spend almost no time basking and a lot of time digging into the snow looking for buried treasures (food) and running up and down trees to stash whatever they find away. We think of Spring as a wonderful time of rejuvenation and regrowth, but until leaves and flowers actually start appearing on plants and grass begins to green up and grow, plant eaters are still faced with barely anything to eat. 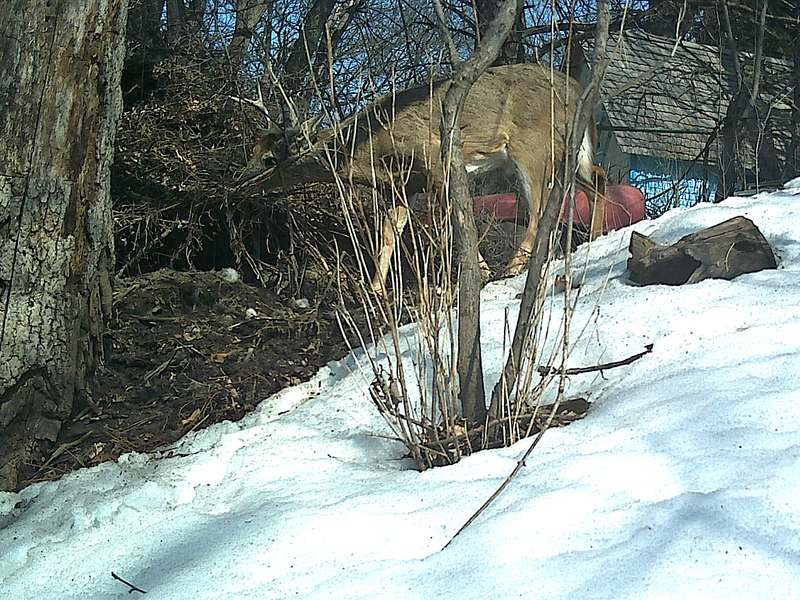 Having eaten through their stored food and consumed anything that was half way edible over a long winter, animals could be faced with a starvation diet just as lakes are thawing, temperatures are warming, and days are getting longer. Yes, I see you eating those tree buds. 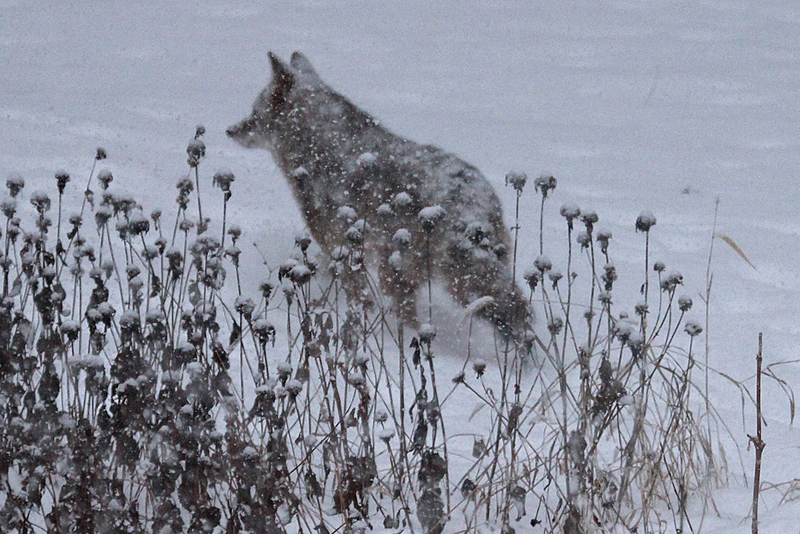 And then I watched as he nipped off another bud and devoured it as well. 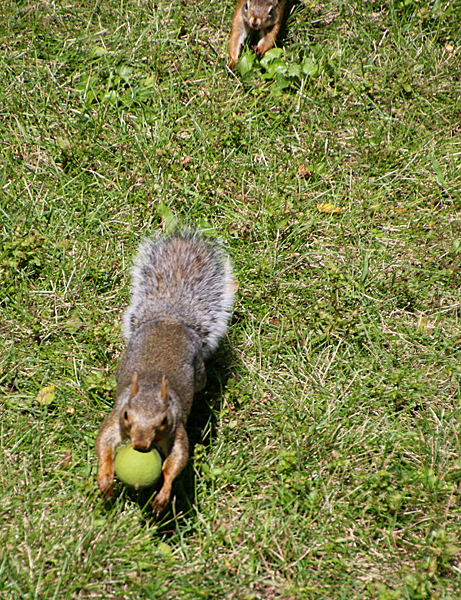 Biting it right off — good thing the squirrel has those sharp teeth. Plant tissue can be tough. He/she is watching me watching him/her. Young buds probably have higher nitrogen and mineral content per unit weight than more mature leaves would, nutrition meant of course for the development of new leaves. 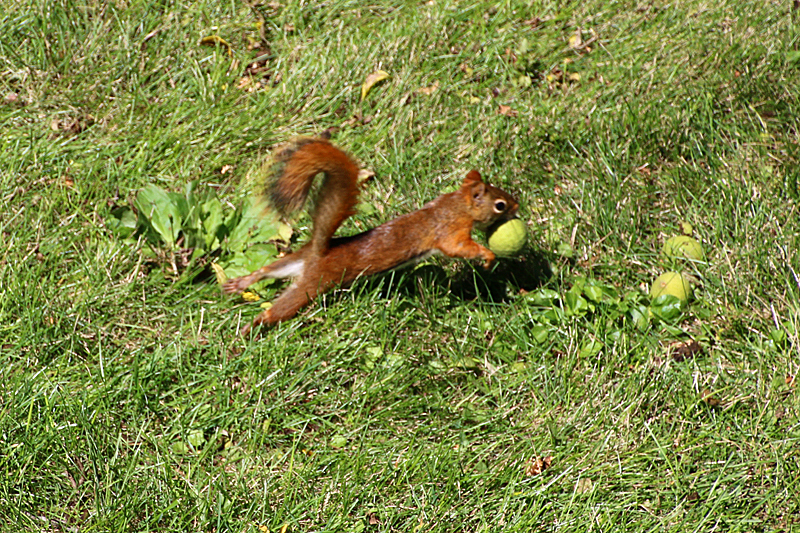 So this is a pretty smart choice for a Red Squirrel that might be down to its last acorn in the larder. 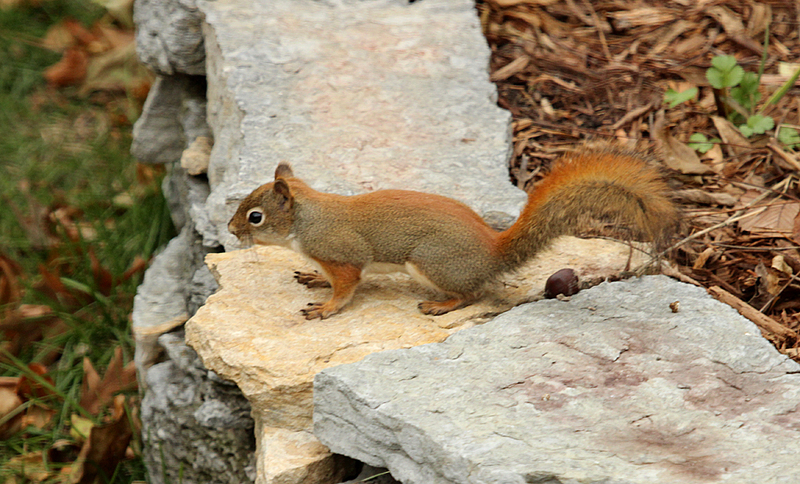 Red squirrel vs landscape cloth — which is tougher? Without using those chisel teeth to bit off a chunk, but just raw muscular pulling power, red squirrels are no match for the plastic sheeting I use to reduce weeds in the garden. 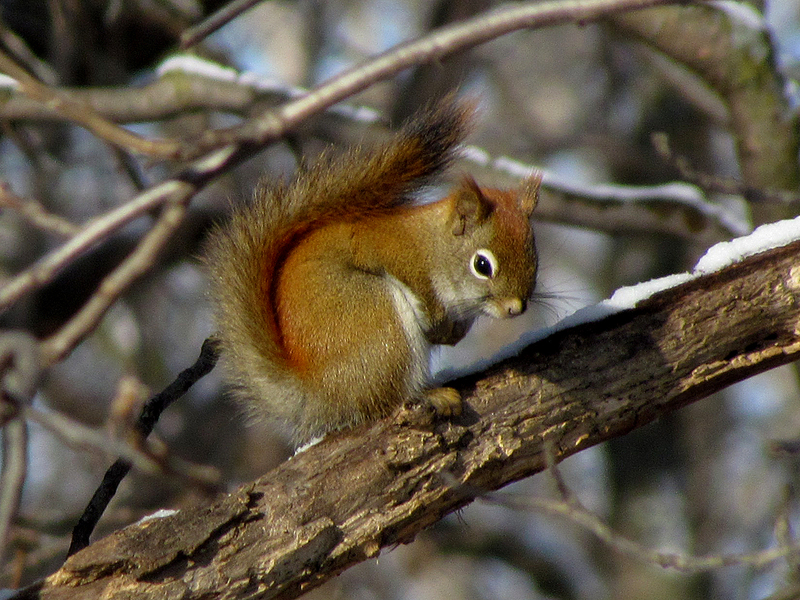 But it was amusing to watch the little squirrel try to separate a piece of the cloth, perhaps as insulation in its nest. I think leaves would probably work better, however. This stuff just won’t budge, even though the squirrel pulls with all he can muster. In frustration (I guess), this little squirrel gave up and chased a couple of gray squirrels around the garden for a few minutes. 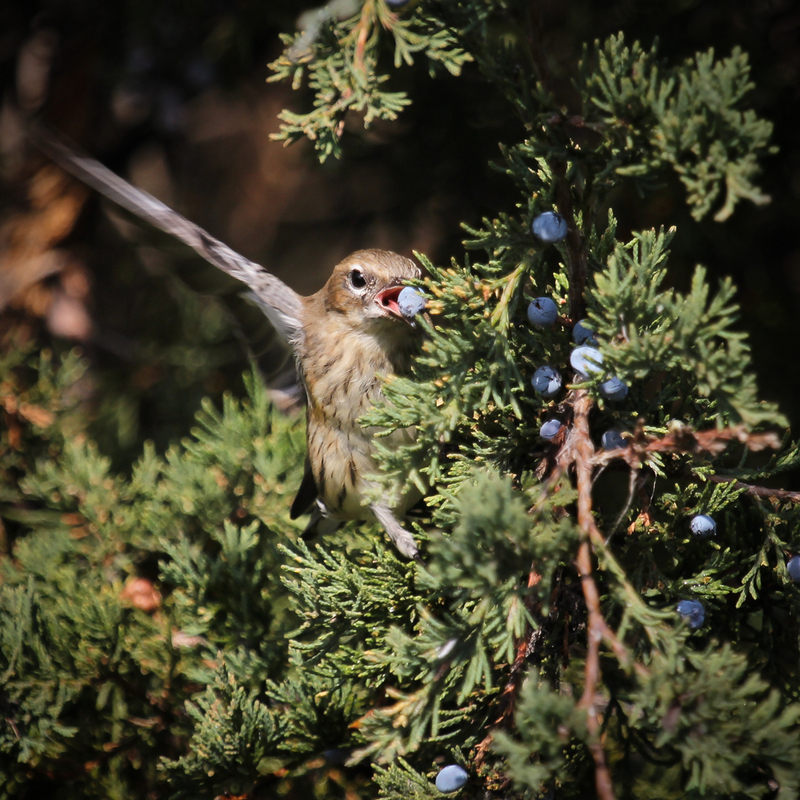 Eastern Red Cedars are loaded with plump, blue berries that look ripe for the picking. To be completely correct here, Red Cedars aren’t really cedars — they are junipers, and the berries aren’t really berries — they are cones with a fleshy covering. 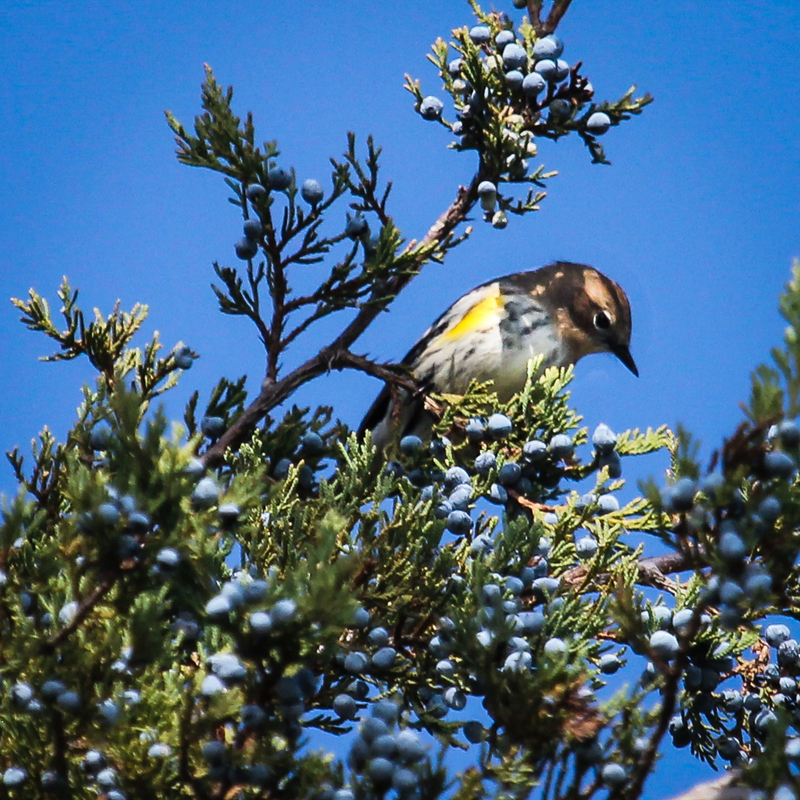 Yellow-rumped Warblers and Cedar Waxwings were swarming “fruit”-laden branches at the St. Paul Reservoir the other day. 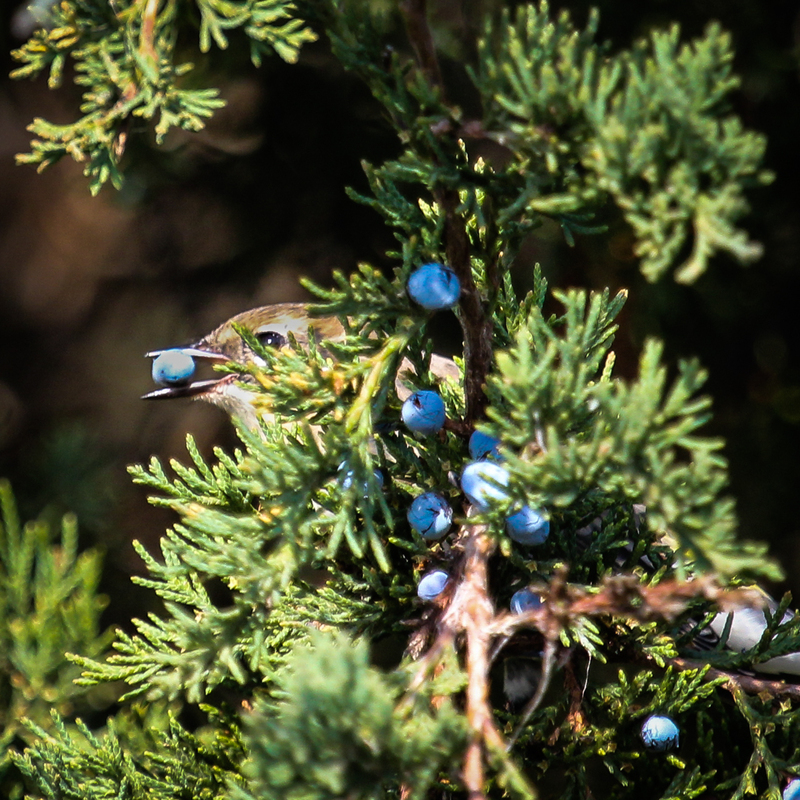 The warblers, in particular, were comical to watch as they attacked the “fruits” which were almost too big for them to get into their mouths. The new growth where most of the berries were found weren’t strong enough to support even a 15 gram warbler, so the birds hung upside down to get them. 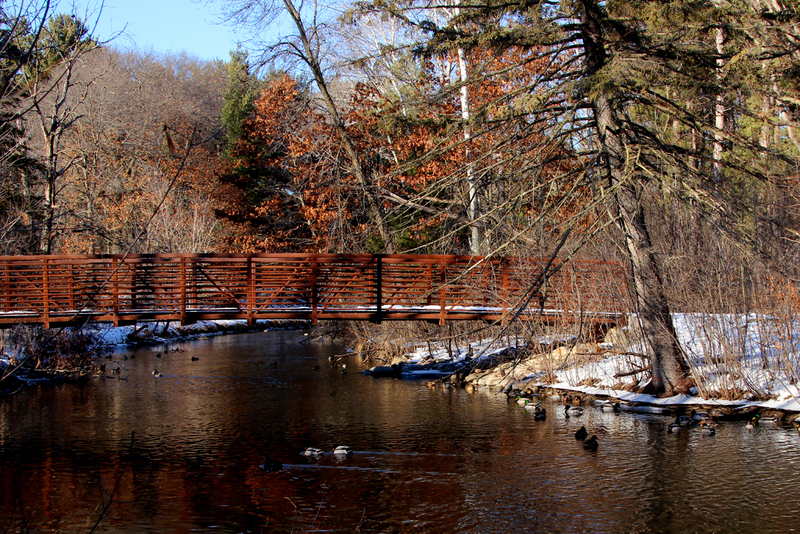 Dense foliage of the red cedar provides great protection from predators, too. The top of the tree provided a little better support for berry picking. Sometimes, berries were snatched on the fly. 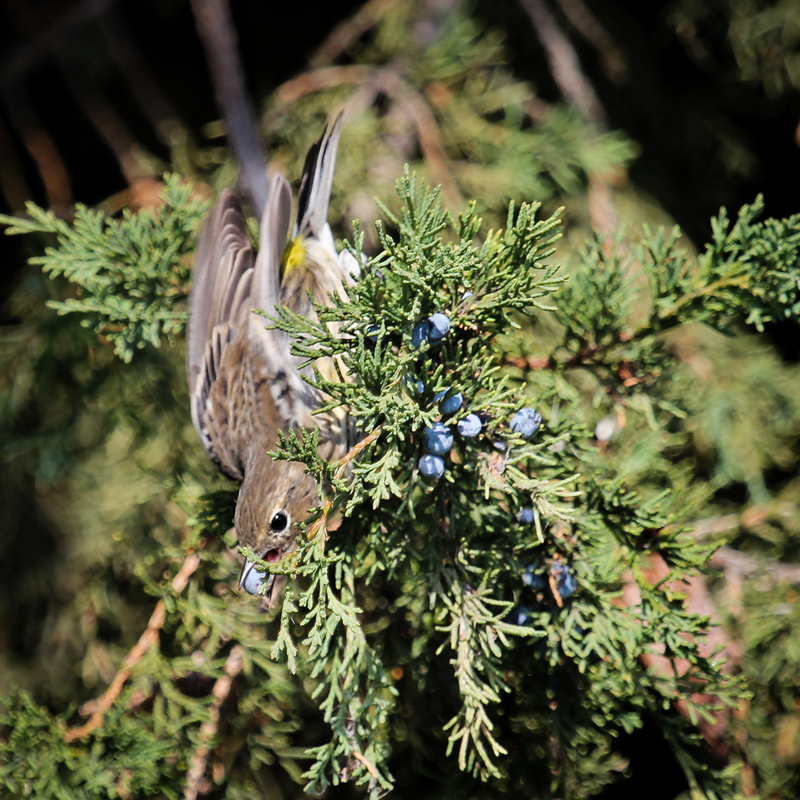 With their high sugar content (30%) these berries are a great resource for migratory birds. 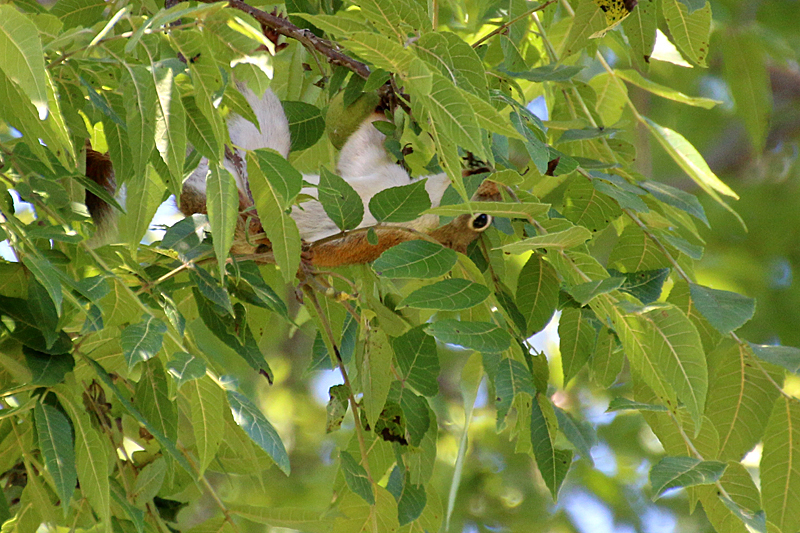 Even their waxy coating can be utilized by the birds, whose digestive systems have been primed to secrete an enzyme to break down the wax esters. Junipers (and in particular the Eastern Red Cedar) leaves and “fruits” contain other useful compounds, one of which is a fairly potent antiviral against common flu and herpes viruses. Florida’s Seminole Indians used juniper extracts to treat colds, swollen joints, stiff neck and back, eye diseases, fever, headache, diarrhea, etc. In addition to teas brewed to relieve these ailments, juniper berries have been used as flavorings in gin and French Chartreuse liqueur, as well as several wild game recipes. 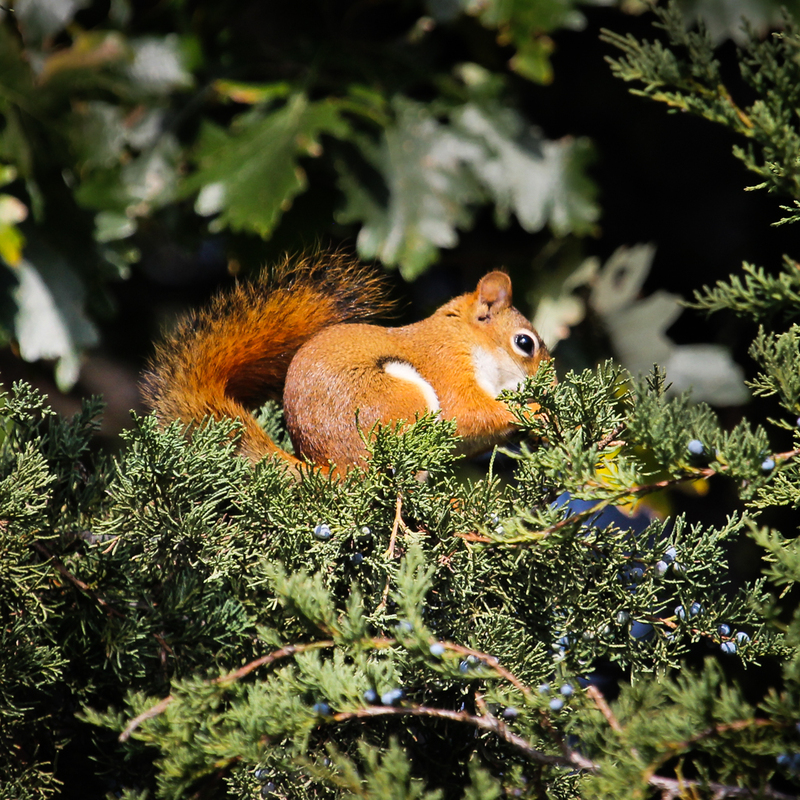 Even the Red Squirrels enjoyed feasting on the prolific crop of juniper berries. Walnuts drop like big chunks of hail in the backyard these days, as the gray and red squirrels begin their fall harvest of the nut crop. A few of the nuts are shelled and eaten on the spot, which leaves a nice coating of dark brown walnut varnish on sidewalks and deck boards. But most are carried off to their winter larder. 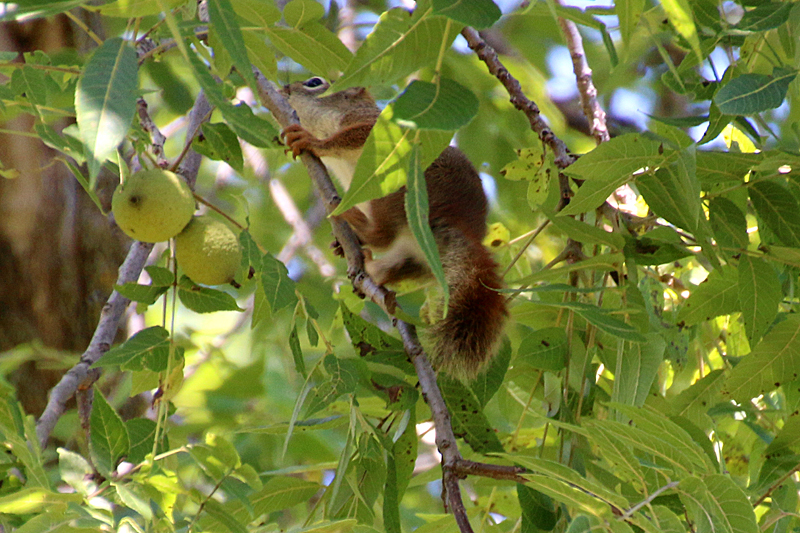 The strategy for this harvest is apparently to scale the tree and climb down the ends of the walnut branches, liberate a dozen or so walnuts, and then scurry to the ground and carry them off, while fending off the interlopers. 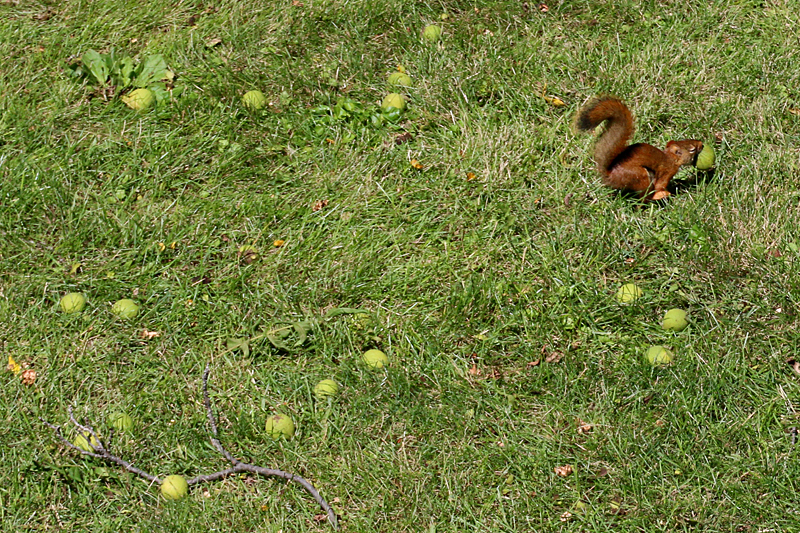 Walnuts ripe for harvest attract this red squirrel, who is quickly cutting off a dozen or so nuts. Hanging upside down is sometimes the best tactic for removing some of the nuts. The problem with dropping all those nuts on the ground at once is that it attracts other walnut lovers, who can then help themselves without putting in the work of harvesting them. The red squirrel in the tree dropped most of the nuts in a concentrated patch, but another red squirrel made off with a few of them before the one in the tree could get down. 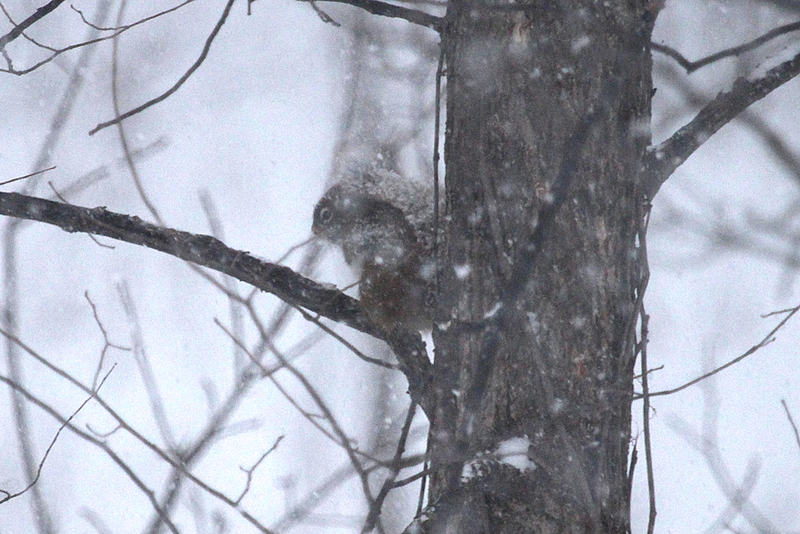 A gray squirrel made off with a few of the nuts too. 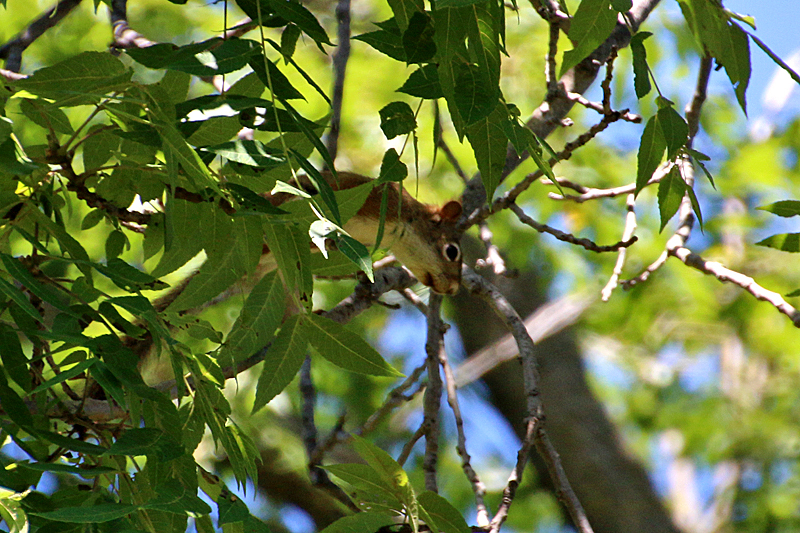 Red squirrel in the tree is quite upset at all the thievery going on. A lot of squirrel chatter ensues. Down the tree the squirrel came in a flash, chased away a couple of other red squirrels and took off after a much larger gray squirrel (unfortunately these guys were just too fast for me to photograph). 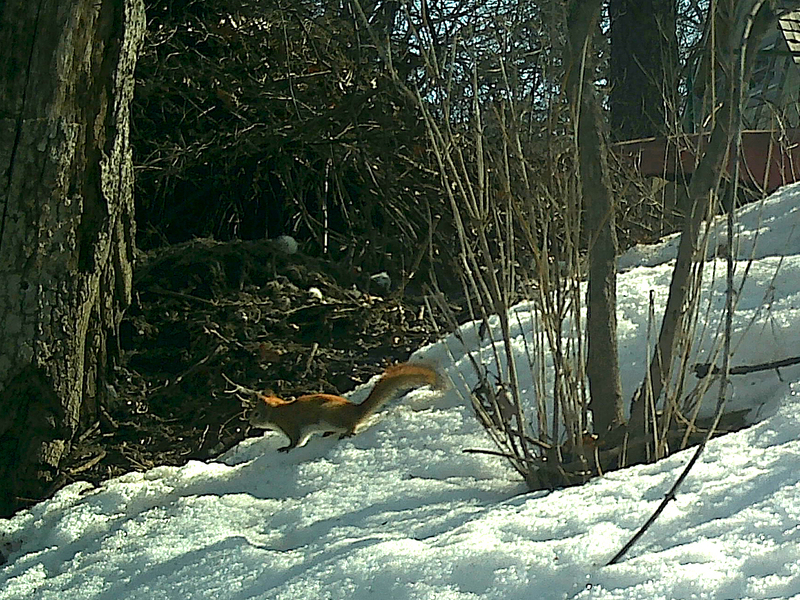 You can just see the red squirrel (at the top of the photo) chasing the walnut thief. Finally taking control of its hard-earned harvest of walnuts. 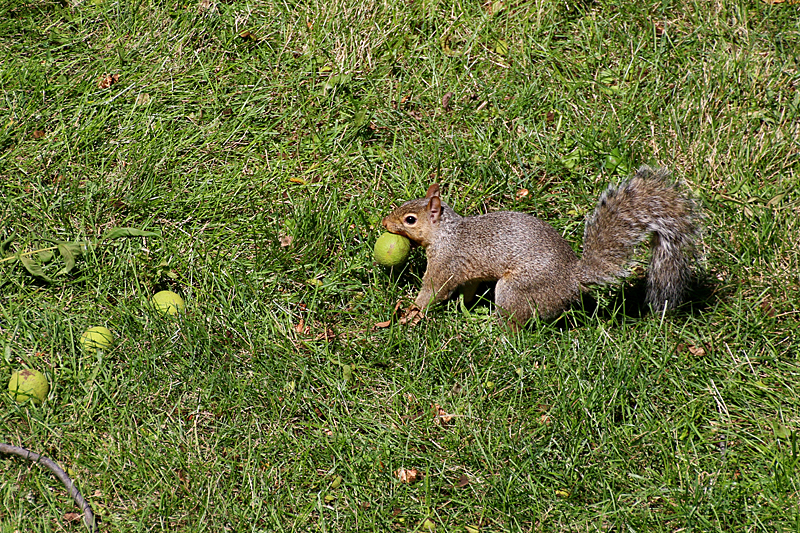 Off the squirrel goes to stash a nut in its larder; repeated at about 2 minute intervals until the entire pile on the ground was gone. After seeing a great photo of a bluejay carrying three acorns in its beak (in a recent post by Mike Powell) I thought I would do a little experiment in the backyard to find out whether squirrels or birds would be the first to find a new supply of acorns. 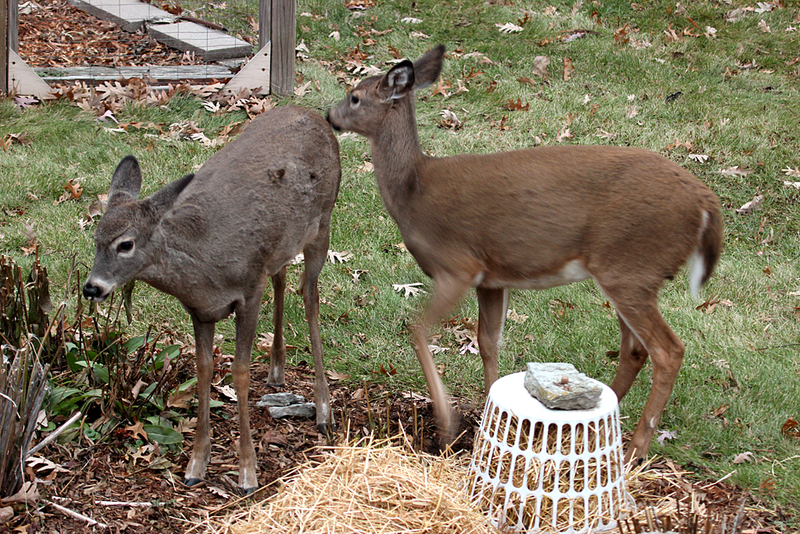 I positioned a half dozen acorns around the yard in plain sight, and started my timer. But apparently, not all acorns are equally attractive, and the kind I picked up were too big or too distasteful to attract attention. 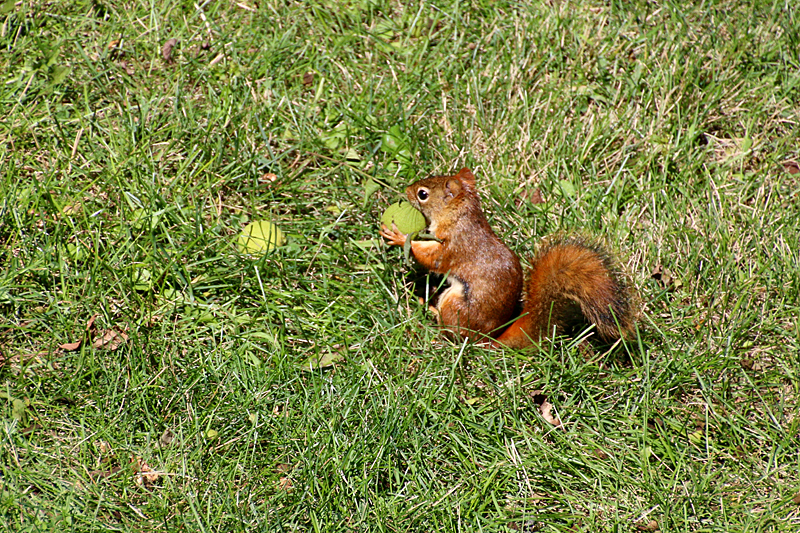 The red squirrel barely gave my acorn a glance before moving off to find other goodies. 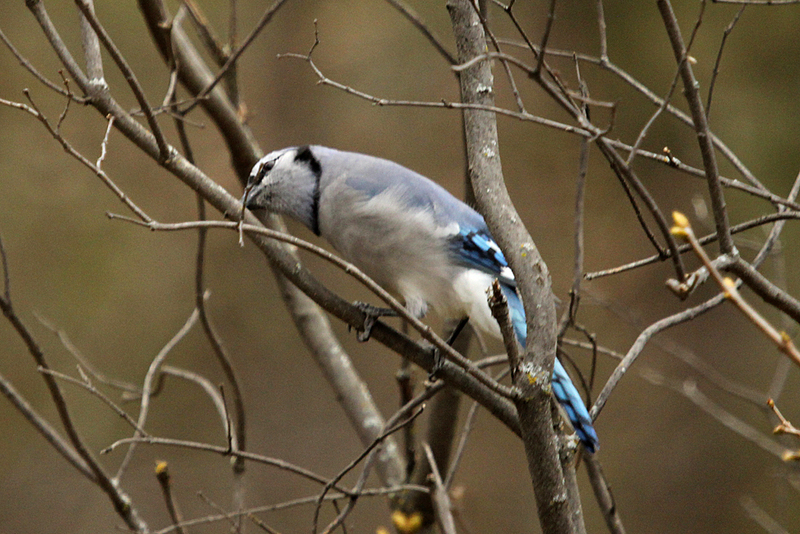 The bluejay gave it a really good look, first with one eye and then with the other. I wonder if this head tilting behavior to inspect potential food means that they don’t really have binocular vision? The twins were less than impressed. The one on the right gave the acorn (sitting conspicuously on a rock at nose level) a sniff, but couldn’t get away fast enough. 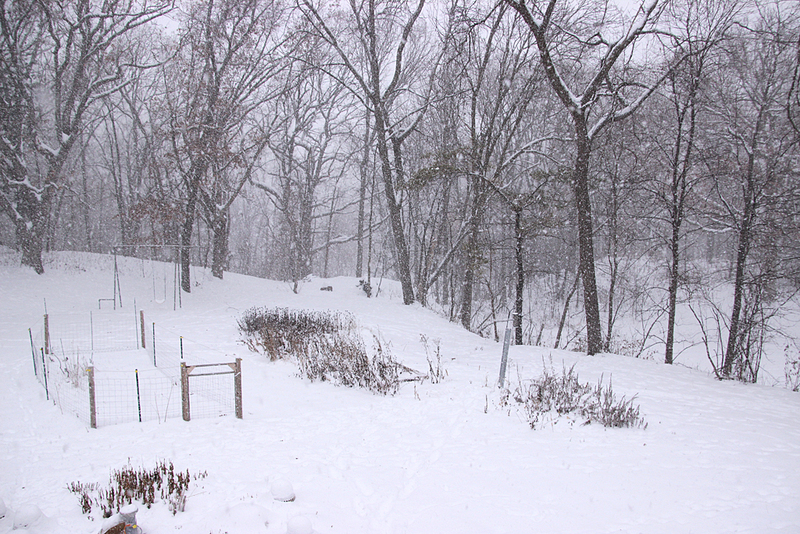 Well, so much for my backyard experiment. All of the acorns are still in position. Yet, acorns are a part of the diet of all three of these species. They must have been inferior quality. Rejected! The fox den has become much too popular. 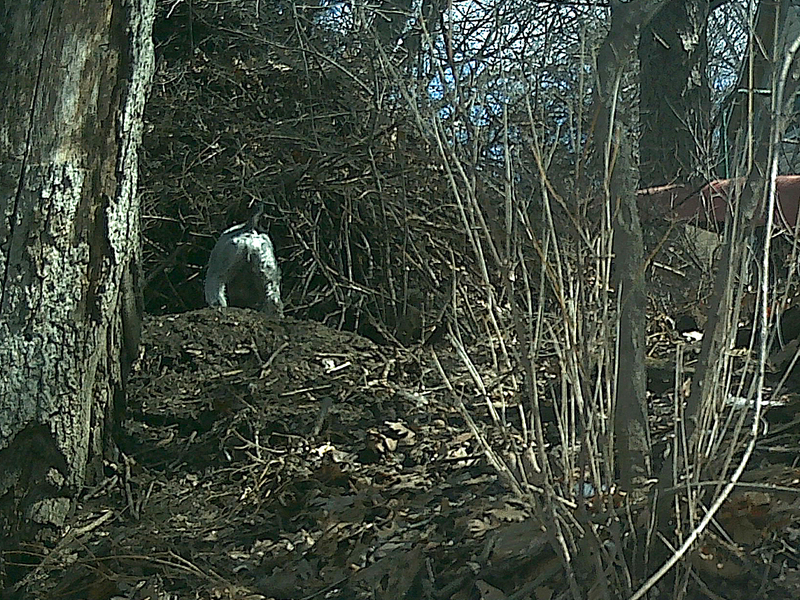 I didn’t think it was that obvious under the big brush pile at the top of the hill, but the camera records visits from humans, and dogs, as well as various wildlife species. Here’s a sampling of what I (or rather the camera) recorded over the past week. “I’ll gladly take your left-overs”, says the Opposum. 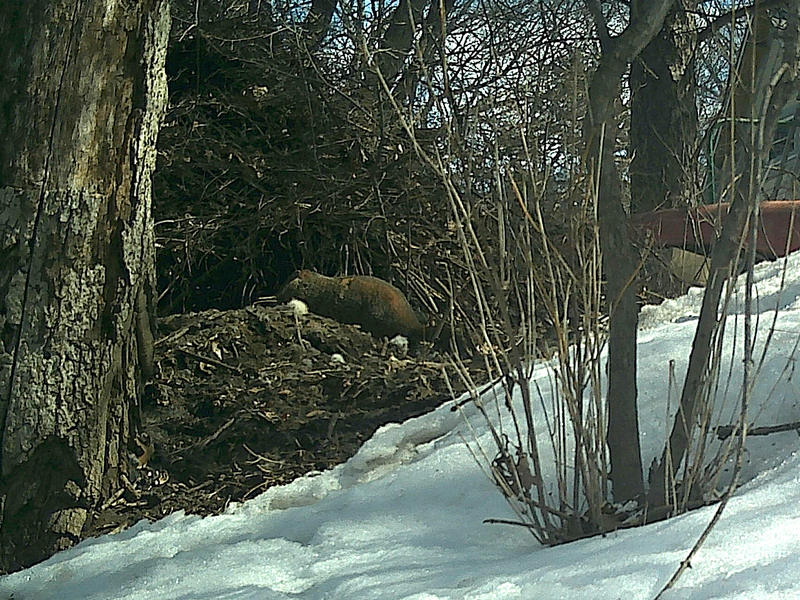 It would have been interesting to see how the foxes responded to this brave red squirrel that ran right in front of the den, but they were not home at the time. 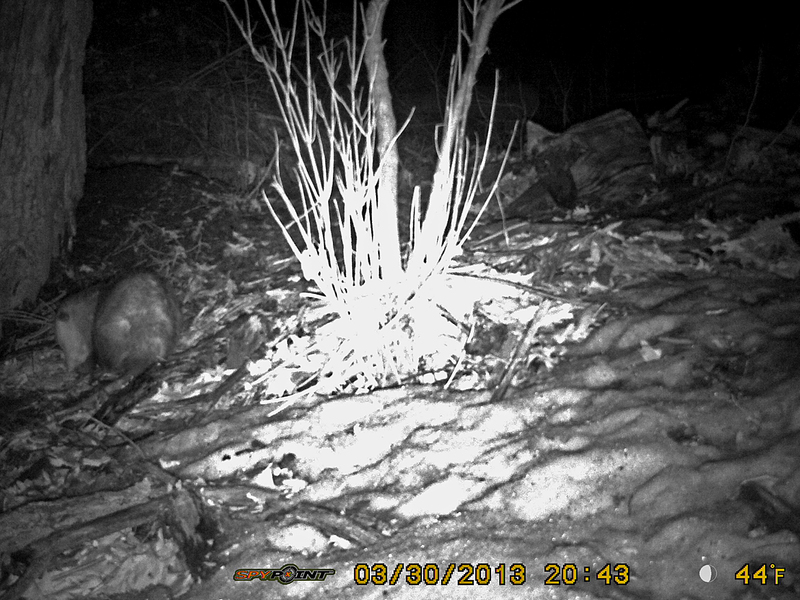 A potential usurper of den space, this woodchuck spent several minutes here checking out a potential nest site for itself. 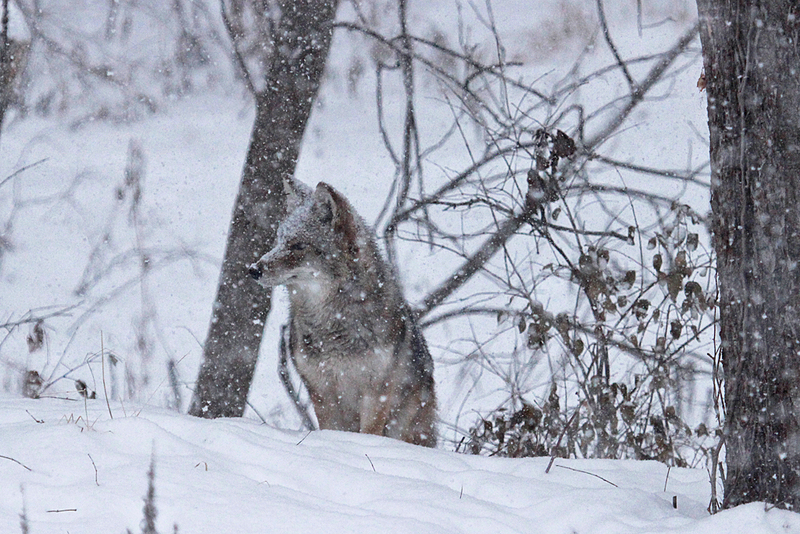 I wonder if this animal could fend off an attack by an adult fox. But the next set of visitors concerns me. 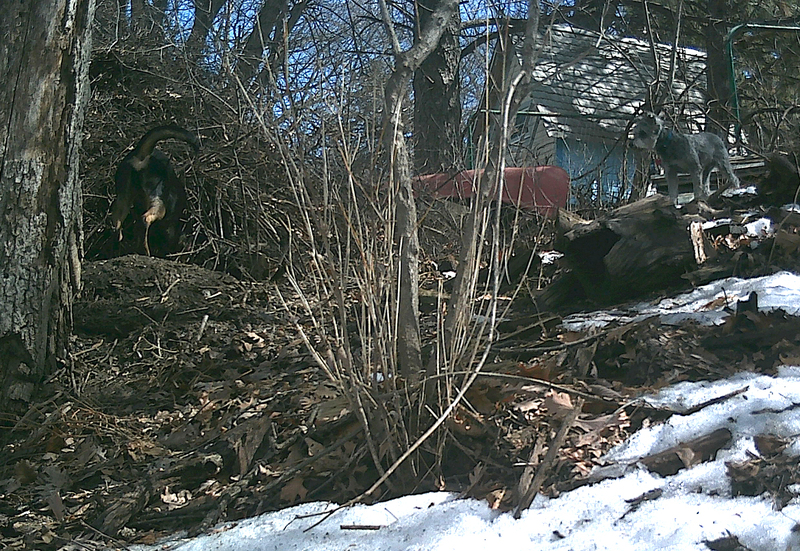 These two prowl the neighborhood and the wetland, which is not legal, and despite neighbors’ complaints about their wanderings. I worry for the kits’ safety with these two around. The smaller one fits into the den entrance, but he’s not much bigger than the kits. The bigger dog could do some damage. what do you think I should do about them? is skiing (cross-country) without a coat in MN in February, when the sun is out and is high enough in the sky to actually be warm. Over the bridge, and through the woods, to see what I could see. 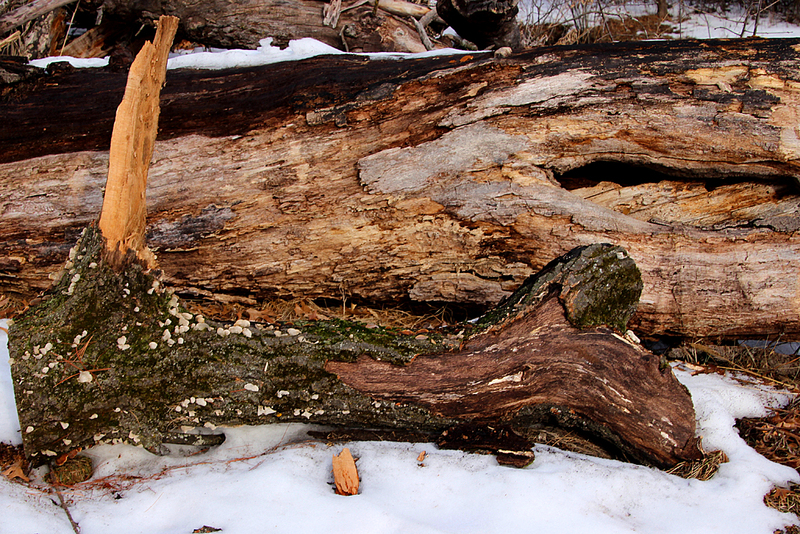 Moss and fungi on a log. As soon as snow melts off the surface, the moss greens up. 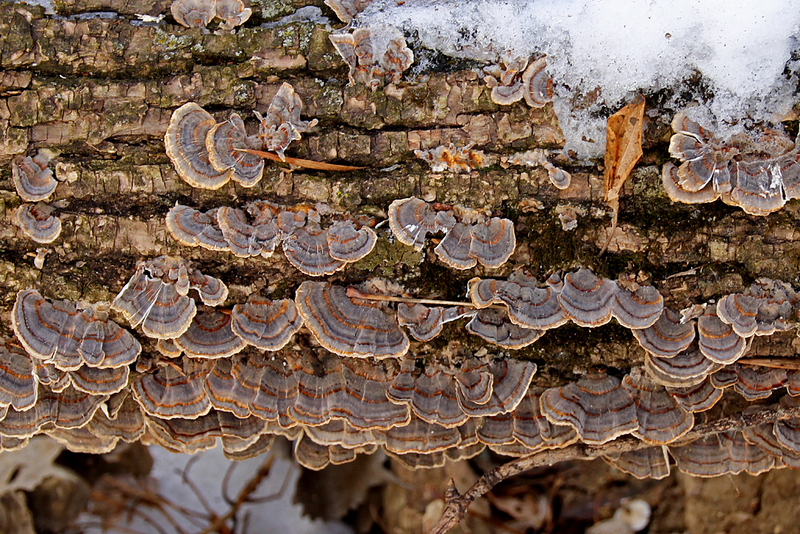 Turkey tail fungi sort of resemble the real thing. Chattering at me from his tree top perch. I made a few stops for photos on my 5 mile route, but even so, I can walk/run this trail in the summer much faster than I can ski it. But today, I was in no hurry to end this peaceful, perfect day.